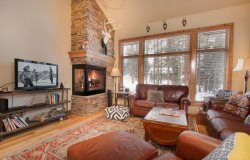 These condos are perfectly located in Downtown Breckenridge adjacent to the Peak 9 Base area and the Beaver Run Chairlift! Or, if you are feeling more adventurous, Peak 8 and the Gondola are both a short, FREE shuttle ride away! Guests can ski home at the end of the day via the Four O’Clock Ski Run which is only five minutes away from the complex. Plus, all of the premiere shopping, dining, and drinking that Main Street offers is just one block away from these fantastic condos. Included with this fabulous condo are granite countertops, underground garage, wifi, cable, a new sofa, and more. The best feature of this great condo, however, is the extra-large family gathering area. Perfect for relaxing at the end of the day, the comfy layout is certain to please. Guests also enjoy seasonal access to the Upper Village heated indoor/outdoor pool! Underground garage for one vehicle plus additional outdoor parking for one vehicle. Four of us stayed in this condo over New Years and had a great time! There was plenty of room for two couples, with two bedrooms, two bathrooms and a large living room. The condo was clean and well maintained. It was a short walk to the ski slopes and the downtown. The Ski Colorado staff was very easy to reach and accommodating when we got to town earlier than the planned check in time. Overall I would definitely recommend staying here! Fantastic location, very close to both the Breckenridge night life and skiing! Would stay here again! We checked in after hours and the process was simple. The condo is roomy, clean and furnished with all that we needed. The location is great for walking to restaurants, entertainment and Peak 9. This place was amazing- great location to walk everywhere in town. Very spacious and clean. Only wish would be to check in a tad earlier and check out a tad later. Thank you for a great trip. Great location - less than a 5 minute walk to main street. Very spacious interior, the pictures represent the condo well. Nice couches and furniture. Kitchen was more than enough to handle an occasional meal in the condo. Wonderful & well-equipped condo with very spacious living areas. It's also in a perfect location in Breckenridge for all types of summer activities in the area. Awesome location!!!! Close to public transportation & Main St. This place was awesome. My friends and I enjoyed it. Location was excellent - walking distance from the peaks we snowboarders at. Great place, really easy to get to peak 8 lifts. Loved it! Perfect place and location. Great rental. Fantastic staff. May need to work on creating a system for last minute bookers, but overall great experience!